The sound of rushing water around you. 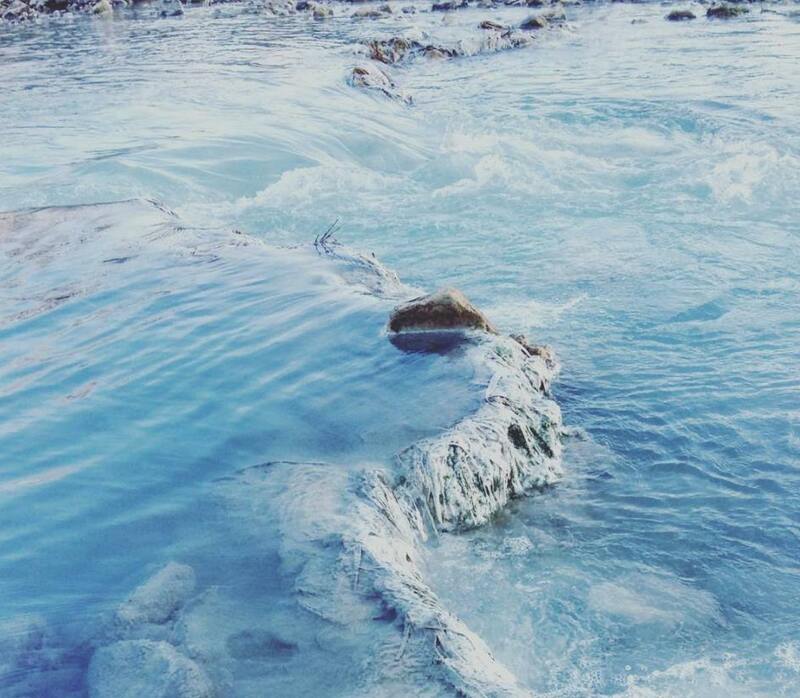 Glistening pools of warm turquoise water carved naturally from the travertine rock. A 360°C view of the incredibly unspoilt Tuscan countryside. 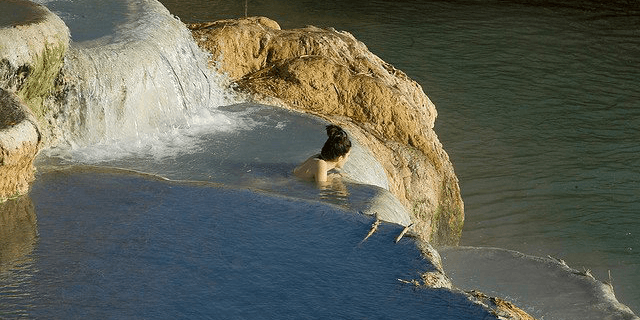 Welcome to the world’s most famous hot springs: the Cascate del Mulino. The first time I visited these waterfalls just outside Saturnia, I thought I was in complete and utter paradise. Now that sounds cliché, but at the time it perfectly summed up how I felt watching the waterfalls rush into pools etched into the travertine rock to create a natural spa, where the water is warm and the view is to die for. Actually the word warm doesn’t really do this water justice. 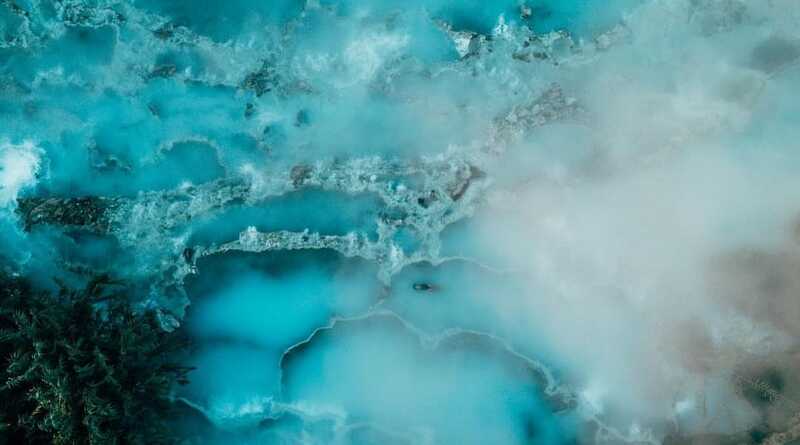 It’s 37°C (98.6°F) constantly and comes from a source underground brimming with sulphur and other minerals. It’s these minerals which I’m told have been curing minor ailments since the time of the Romans. Thrifty locals who don’t want to pay to enjoy the same water in the world-renowned spa complex down the road come to these waterfalls. It’s free and I think the complete antithesis of the modern and, at times, cold spa complex. 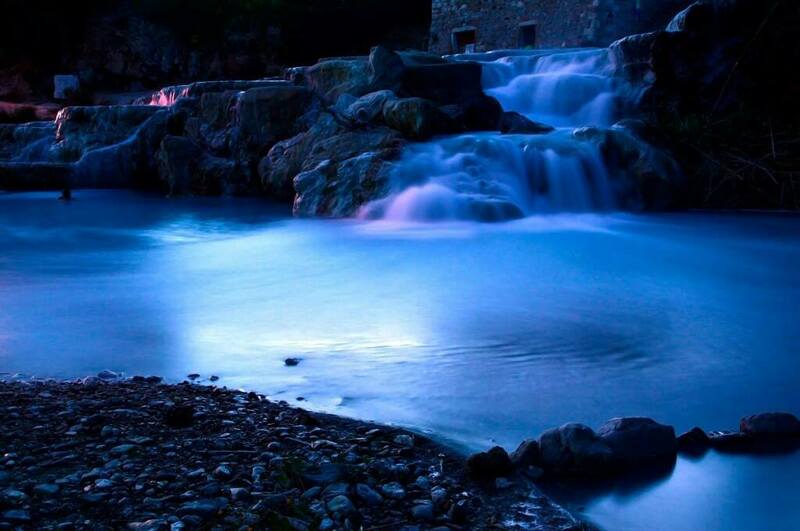 The Cascate del Mulino have plenty of names online. 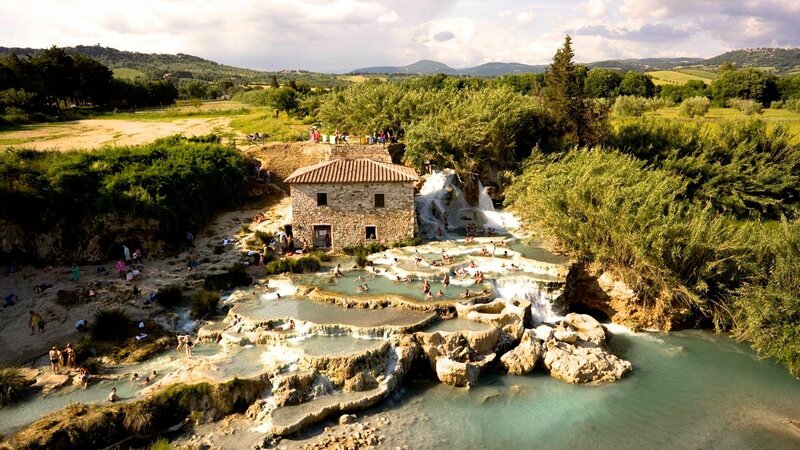 They’re also known as the Saturnia hot springs, Terme di Saturnia and il Gorello, but all the names lead to this one source just outside Saturnia, in Southern Tuscany. Where you’ll find a handful of pools carved into the rock and open to the public 24/7 and completely and utterly free for you to swim in. Personally, I’m addicted to these waterfalls. I visit them all the time, even in the middle of winter, when I’m barely coping with the freezing European climate that’s nothing like the Australian one I grew up in. Sure it’s torture getting your gear off, but once you’re immersed in the waters, it’s indescribable heaven.  the Cascate del Mulino are FREE. You don’t have to pay to swim, sun bake or enjoy the gorgeous scenery at any time of the year. the hot springs are open 24/7. the water gushes from the source at 37°C (98.6°F), but it has dropped a few degrees by the time it reaches the Cascate del Mulino. you’re going to have an amazing time regardless of when you visit, but if you want to avoid the crowds, come on a weekday in autumn, winter and early spring. It can get cold in winter, but the water more than makes up for it. 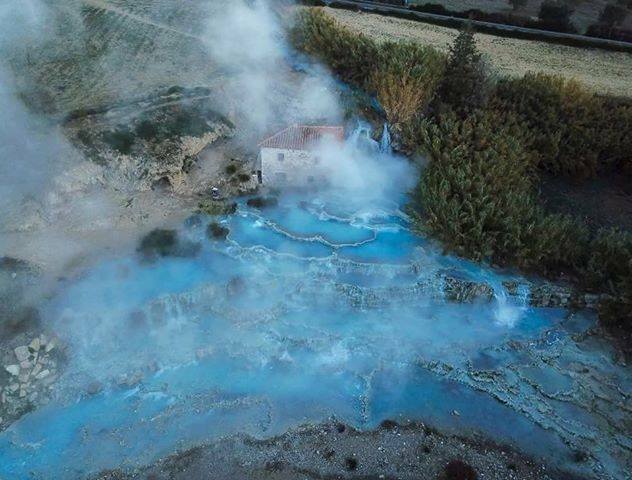 to beat the crowds that flock to Saturnia’s hot springs from May to October, come early in the morning before 9am or late in the evening after 8pm, when everyone else is at dinner. there are no free public toilets. If you have to pee, there is a coffee bar next door, but you’ll have to buy something. again, there are no showers or change rooms on site. You are swimming in a giant natural waterfall after all. Come dressed in your bathers or change in your car. the Cascate del Mulino flows with sulphuric water. Sulphur = egg smell. So be prepared. It doesn’t smell as bad as it used to. Your bathers and skin will stink a little afterwards, but a hot shower should get rid of the smell. keep an eye on young children. The water mightn’t seem dangerous, but there are plenty of sharp, slippery rocks under the surface. Pregnant women and young children are not advised to swim in the hot springs, so always ask your GP before you take a dip. For everyone else, it’s recommended you take a break from the water every 20 minutes.  Dehydration is a real risk when bathing in such hot water, so make sure you drink plenty of water! you will have a hard time getting to the best pools without shoes. Walking through the hot springs hurts. There are rocks everywhere! So a pair of slippers or flip flops will be a god send. Don’t forget sunscreen, a towel and even a beach umbrella if you have one. There is no sand for you to relax on when you’re not in the water. There’s just dirt, so if you want a place to sit, you’ll have to bring your own sundecks. And remember, the Tuscan sun is hot in summer, so bring plenty of SPF. And lots of water or you will feel sick. 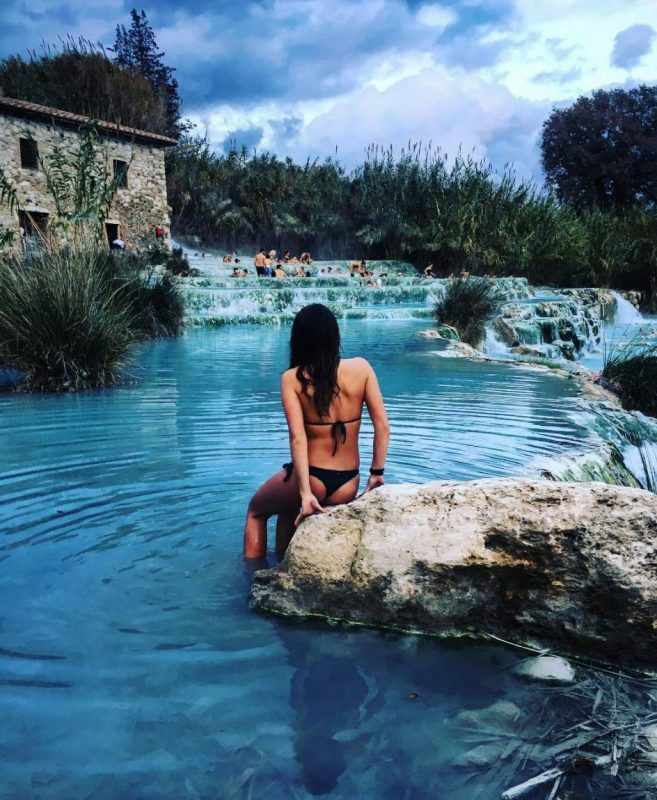 the Cascate del Mulino hot springs is a very popular public space. 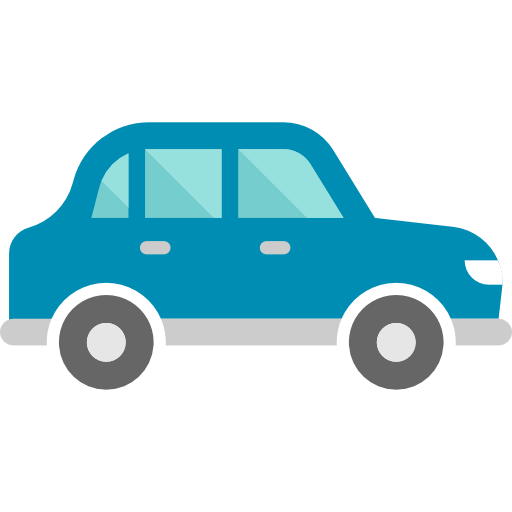 Thieves know that, so always keep your car locked and your valuables safe. If your jewellery isn’t pure gold or silver (or even if it is), take it off before you get in the water. Otherwise it will turn green/black. Trust me, it’s happened to me too many times. Probably not a good idea to wear your best bathers either. The water can damage the fabric. the water is a bit slimy and there are red mini worms swimming around in there. I have had friends who absolutely refuse to swim in the hot springs. They say it’s too gross. This is part and parcel of coming to a hot spring. 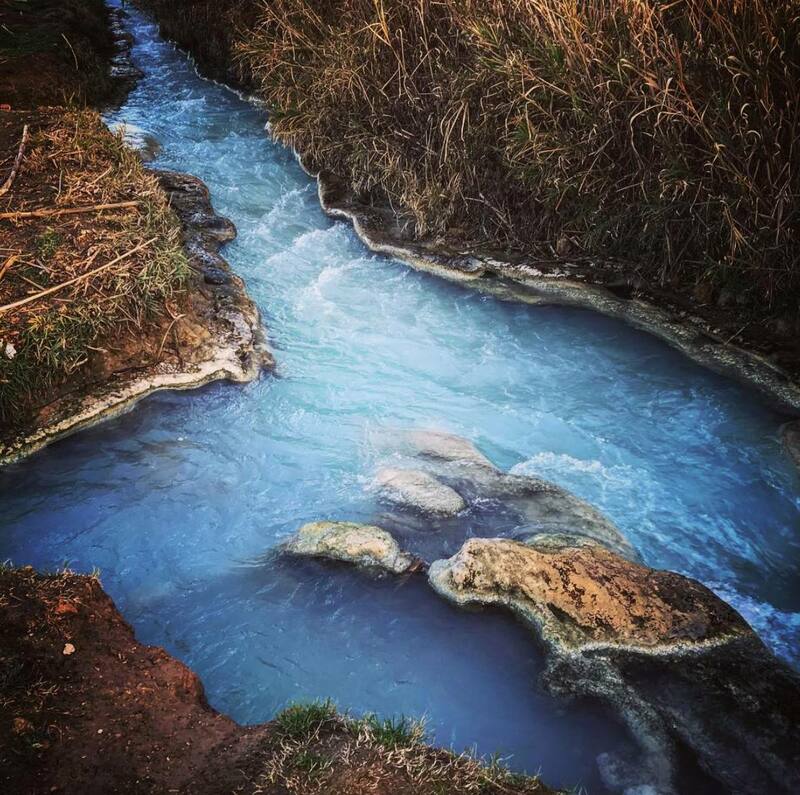 If you want perfectly clean, pristine water, head to a mountain spring instead. there is a small snack bar next to the hot springs with indoor and outdoor tables. There’s also a vending machine, but don’t expect the food to be good, cheap or particularly fresh. Bring food and drink from home. Otherwise, Saturnia and its many good restaurants are a 40 minute walk straight down the SP10. the Cascate del Mulino hot springs are open 24/7, which means you can swim in them after dark for free whenever you like, but my advice is bring a torch. There are no lights at all, so you won’t be able to see the rocks. Hence you might fall and seriously injure yourself without adequate lighting. Who is the person giving you all this advice, you ask? My name’s Elisa. 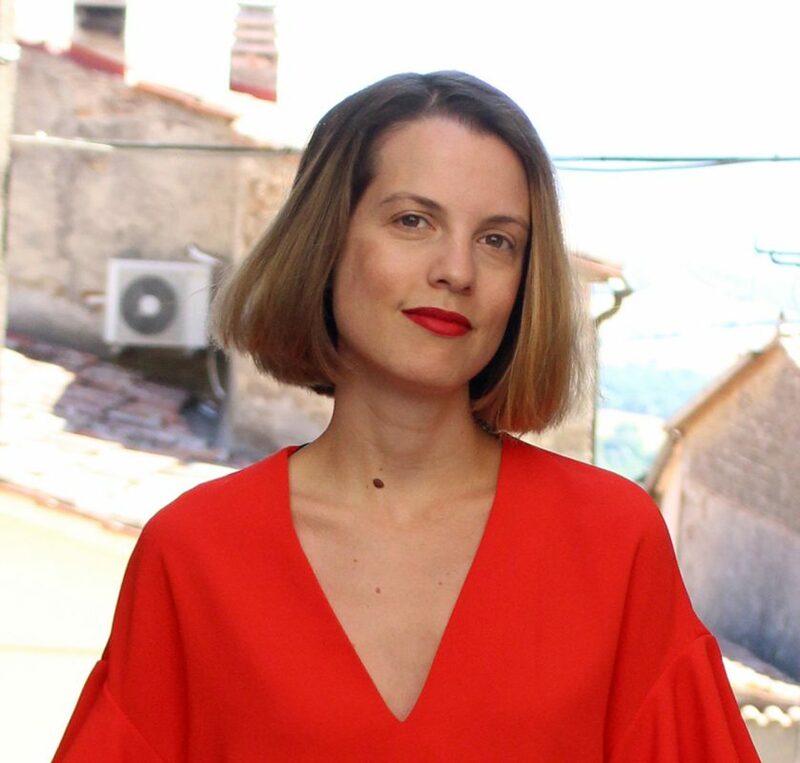 I’m an Australian journalist who came to Tuscany for a year, fell in love, how cliché? And decided to stick around. Not one to keep paradisiacal holiday destinations to myself, I now writes a Tuscan travel blog and online travel guide about the infinitely beautiful Tuscan Maremma, so that others can get a taste of la dolce vita. 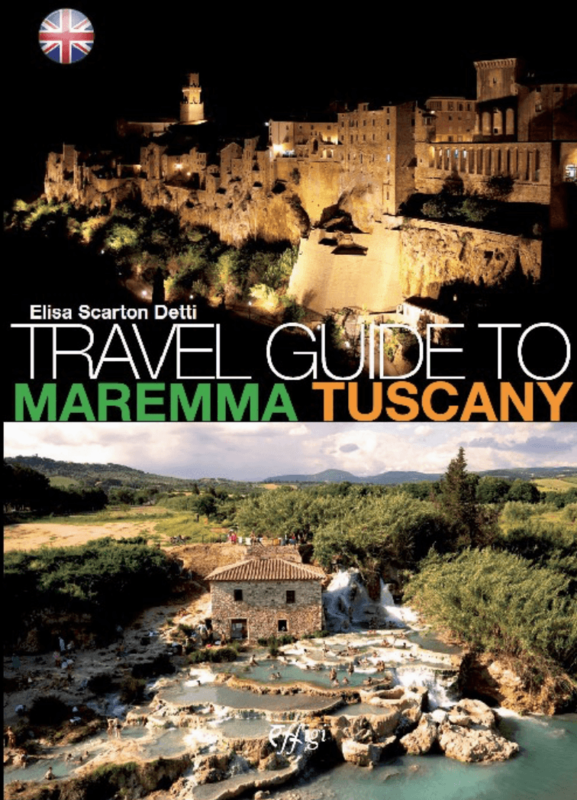 I’m the author of the only English language guidebook on the Maremma and I also happen to live in the town next door to the Saturnia hot springs, so I know a thing or two about them.  feel like a little luxury? 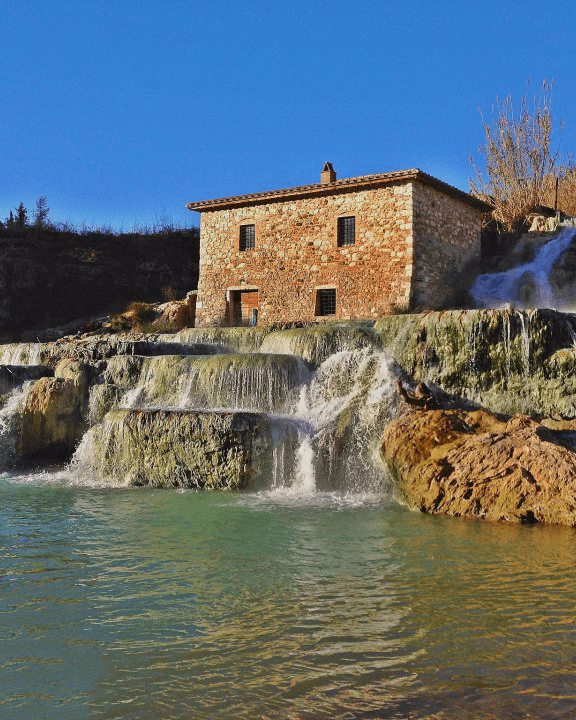 The Terme di Saturnia Spa Complex is located down the road from the Cascate del Mulino. The spa sits on the source of the springs and is a playground of the world’s rich and famous. Luckily us mere mortals can also spend a day swimming in the spa’s warm pools. Daily entrance starts at €30 for use of the pools. From Saturnia: follow the Strada Provinciale Follonata/SP10 until you see a small sign or a lot of parked cars! From pretty much anywhere else: The springs are impossible to miss. You can see them and their imposing mill building as you drive towards Saturnia on the SP10. Distance: from Rome: 180km; from Florence: 200km; from Orvieto: 75km; from Grosseto: 61km. From Grosseto station, the 8/G will take you directly to Saturnia. From Albinia and Orbetello stations, you will need to catch the 41/P to Manciano and catch another bus to Saturnia Terme. From Manciano, the 17/P, E01 and E02 buses will all take you to Saturnia Terme. To plan your trip, check out the Tiemme website. 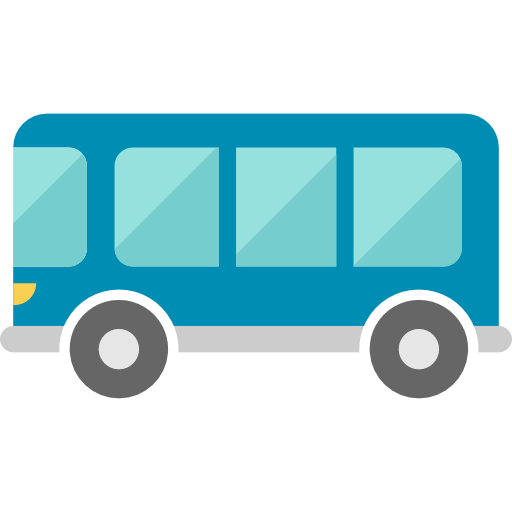 Beware that public transport is infrequent, so always plan your journey well in advance.To plan your trip, check out the Tiemme website.